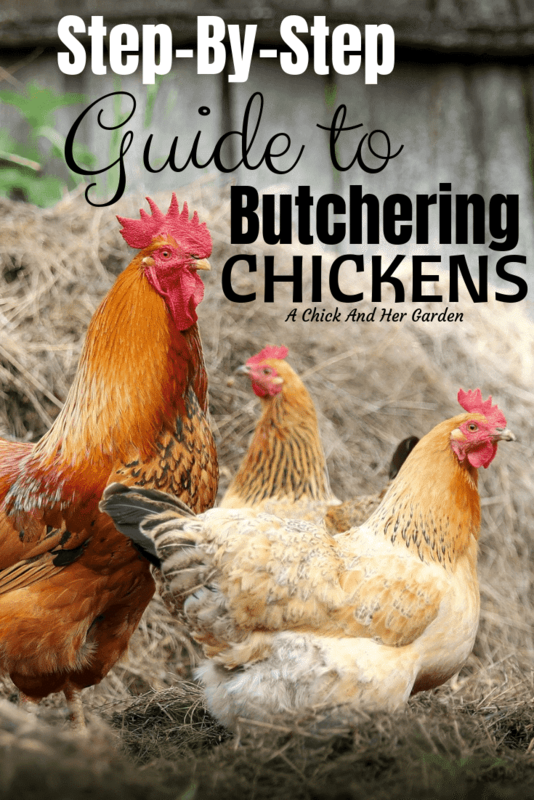 For a long time I’ve debated on posting about how to butcher chickens. It can be a touchy subject and people have come to be pretty sensitive about this topic. I get it! It’s easy to become attached to your girls. I’ve been there. But to not share how to butcher chickens, I think, is in a sense false to the reality of how we live here at the Samuels Homestead. The truth is, this is where our food comes from, and a lot of people have become detached from that fact. One way I make this easier is that I do not name our birds. He was right and I had to learn how to butcher chickens! We eat meat here. It’s a simple fact. Would I rather go to the store and buy meat that I am utterly clueless as to where it’s come from, or raise animals that I know are treated with kindness and respect and fed the best quality food free of antibiotics and steroids. We raise Buff Orpingtions, which you may have seen in other posts. They are a large heritage breed used for both meat and eggs, and are notoriously broody. We allow them to hatch a clutch whenever they go broody. We butcher roosters when they are mature and hens either as we need them or when they have stopped laying. Right now we definitely have too many roos and this weekend is a weekend to butcher chickens. Unfortunately for us there are no fancy chicken pluckers at this house. But because we’re only doing a few, this isn’t a huge problem. Here are the tools that we gather up on butcher day. killing cone, like this one on Amazon, or you can use a road cone, cut to fit like we did. have a water source near by, a garden hose is fine. In this case we caught roosters. I swear every time we do this, and I’ve lost count, this process changes. Sometimes it’s easy, like today. We lured them with a bit of feed and just grabbed them. Most of the time it doesn’t go this way. Hubby gets into the run, corners them and after a lot of swearing grabs them. We try to give as little feed as possible because we keep them separated without food, so that their crops are not full. 2. 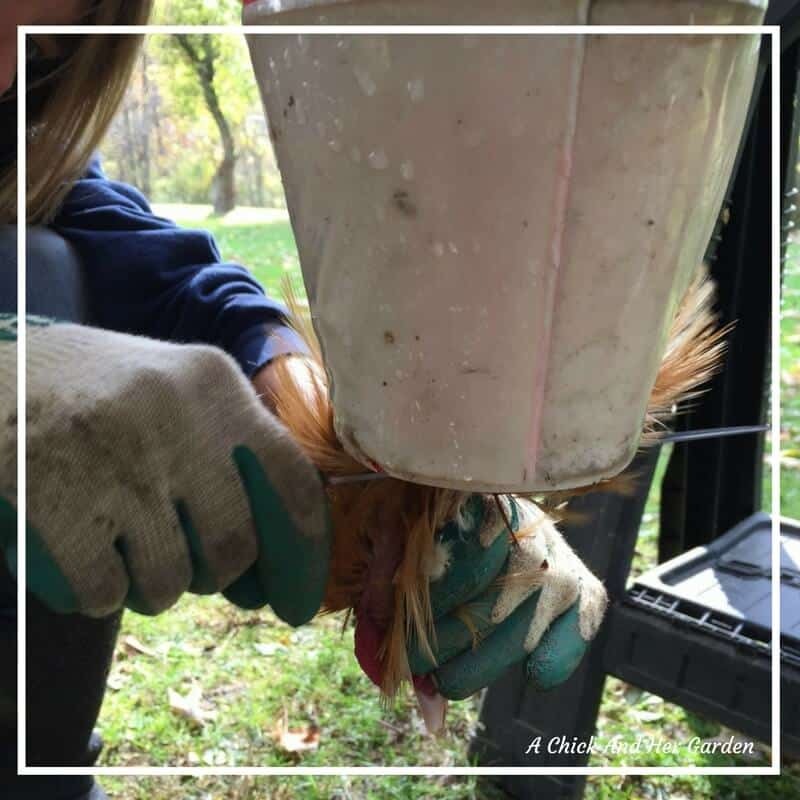 Put Chickens in the killing cone. 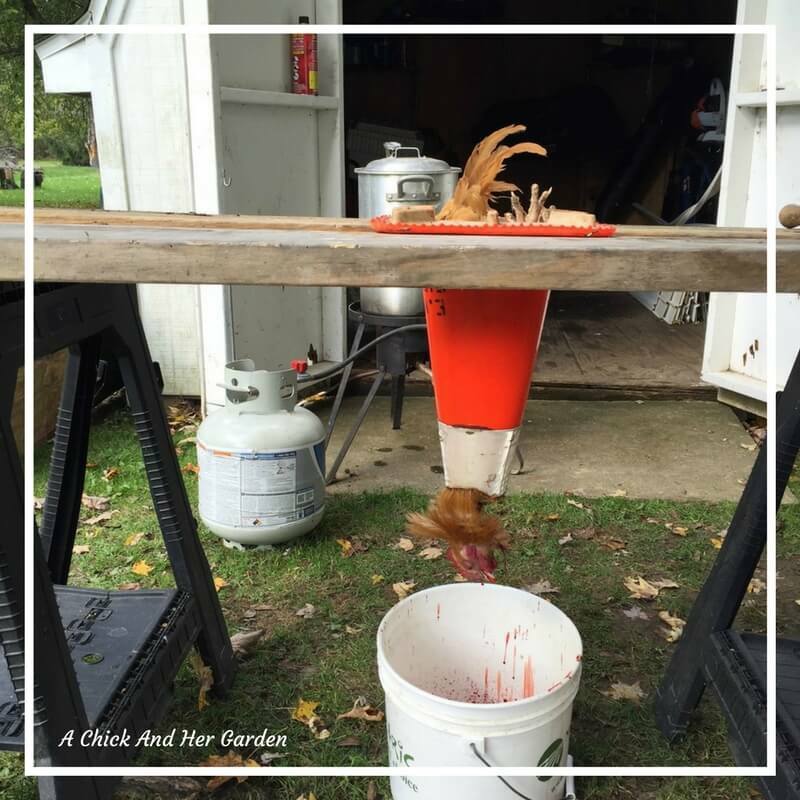 Place your chicken head first in the killing cone. They calm down quite a bit at this point, as chickens will go to sleep when they are turned upside down. You will probably have to reach in and pull their head out through the end of the cone. Pull the feathers back and use your knife to cut the artery. They will kick a bit, but nothing compared to the old chop the head off and let them flop around. A main reason that we use the cone is that by keeping them calm and somewhat still, you are reducing the adrenaline in their muscles and keeping the meat tender. Allow them to drain into a bucket before zip tying their legs. We hang the birds this way while we cull the remaining birds. 3. Dunk the bird in hot water. 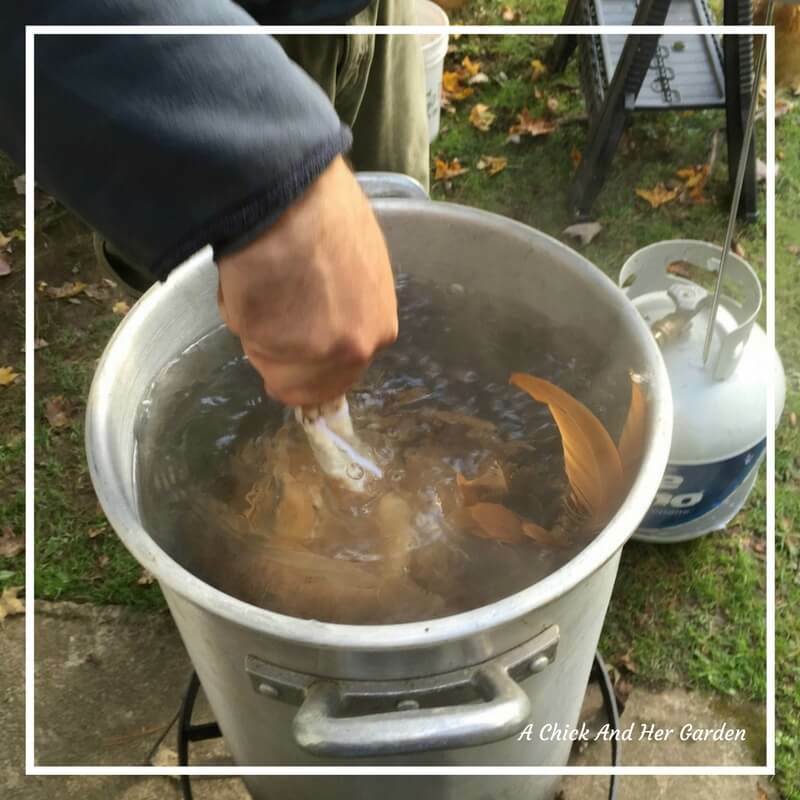 Your turkey fryer should be filled with water and the temperature brought to 160°F. Use the feet to dunk and swirl the bird, making sure to get water under and throughout the feathers. Dunk the bird for about 3 minutes or until you notice the feathers coming off easily. 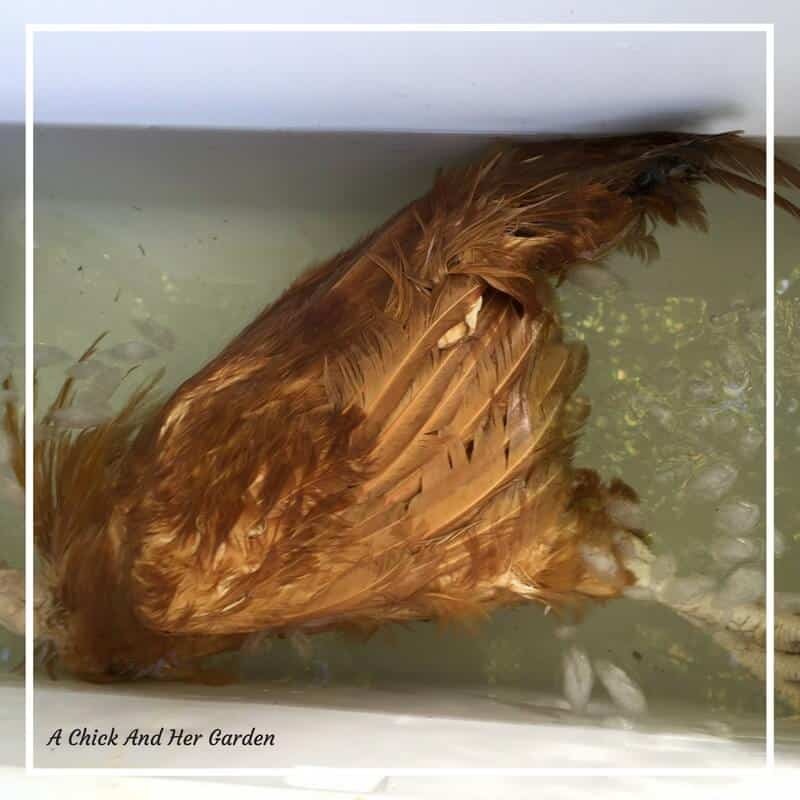 Immediately after the hot water, submerge the bird in ice water, in a cooler. This step and the previous allow for the feathers to literally wipe off. Nick has informed me, that if you leave them in this water too long though it is more difficult to remove the feathers, so just a minute is all you need. On to plucking, and let the groans begin. This is the worst part of the deal, and yes a chicken plucker would be nice, but not worth it for us at this point. The hot water and ice bath really do make this a piece of cake, but lets face it, it’s just not fun having feathers stuck all over your hands and making sure you get every little one. This is a good point to use your hose, rinsing off will give you a better idea of how far you have to go. Once the tail and crop are detached, gently pull and remove the organs. After the intestines are removed, you can reach your hand in to loosen everything else from the chest cavity. To remove the feet, bend backwards at the knee joint, cut around and cut the tendon. They will remove easily. * If you look in the picture above you’ll see fine hairs. This is the reason for the next step. 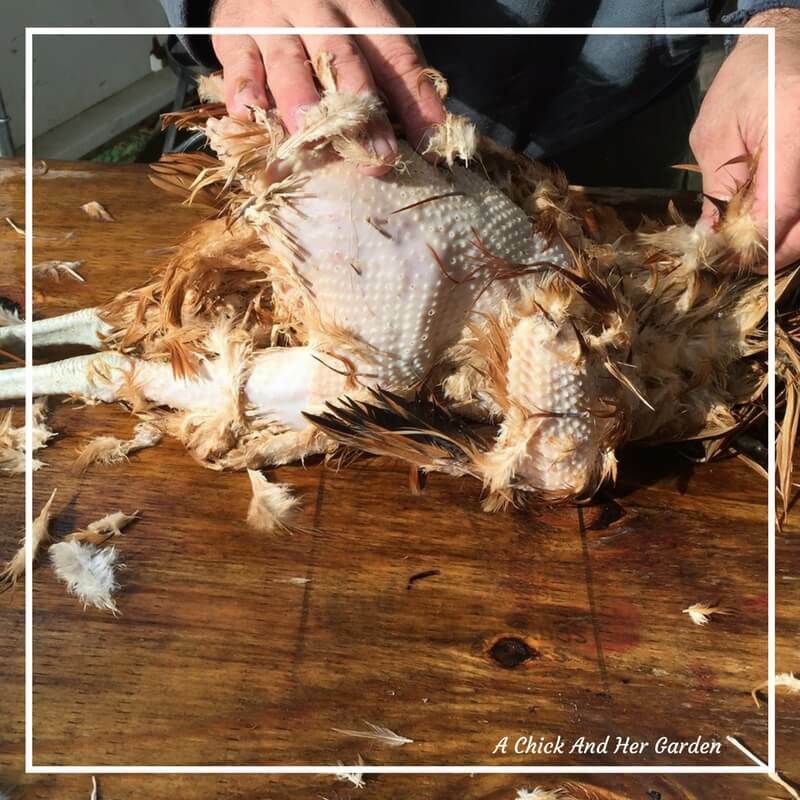 Use the propane torch to singe off the hairs and any remaining feathers. 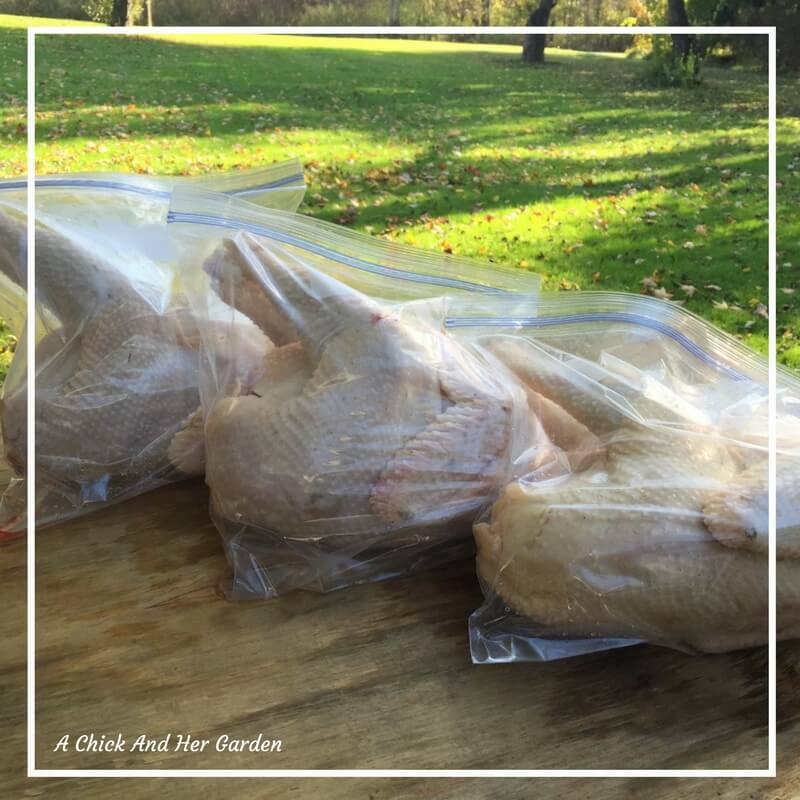 We store our chickens in gallon freezer bags, and try to get as much air out as possible. As much as I would love to use our vacuum sealer, the birds just don’t fit. Keep the packaged birds in the refrigerator for 24 hours and then process, use, or store in the freezer. 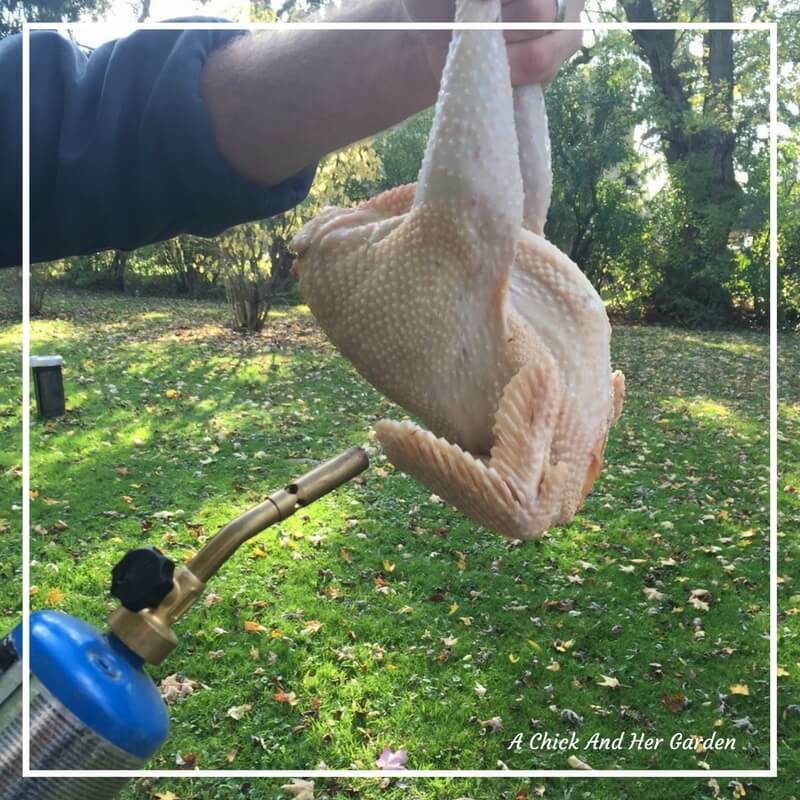 * My favorite way to cook our chicken is with our recipe for The Perfect Roast Chicken! GREAT article! My husband is still cutting off the head…your explanation of the adrenaline probably has something to do with the meat not being as tender, possibly, as it could be. I’m printing this for him! Thanks! You’re right! When the adrenaline goes through the body it does toughen the meat. Ugh, I’m glad you posted this, but I’m not sure I’ll be ready to ‘harvest’ our chickens when the time comes. Hubby, thankfully, is more open to the idea. He actually saw it pulled up on my computer last night and read this article before I did! Great step by step directions! Great step by step instructions! Thank you. I am pinning it for when the time comes for us to need it! I have a contact in town that breeds heritage chooks, I am hoping she has some Orpingtons or light Sussex for us. Thanks so much! We love our Orpingtons! My husband raises meat chickens and they get quite big. He pretty much butchers like you, but we don’t have a killing cone. He puts them in a feed bag, and keeps them in the bag to drain out the blood. 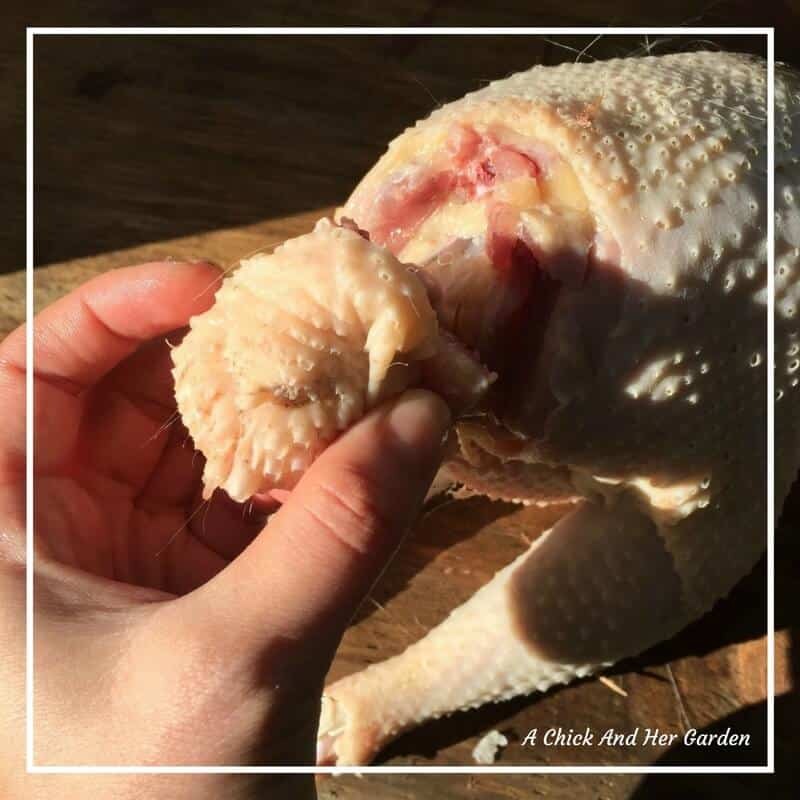 We do vacuum seal them, but they are first cut in half, as they are way too big to seal up whole, and 1/2 a chicken is plenty for us for dinner, with leftovers for the next day! Thanks for sharing this article. I will let my husband know about the killing cone. FYI- I am not sure if it is a typo or what, but after following the instruction on soaking them in the hot water for 3 minutes, our birds were half cooked and the skin pulled right off with the feathers. It was a disaster. 30 seconds with no cold water bath was perfect for us; the feathers pulled easily and no skin was lost. Otherwise, there is a lot of good information here. .